For most Americans, it’s just not the holidays without a mall visit. Chicago-area Woodfield prepped weeks before the Black Friday shopping blitz, debuting an Ice Palace with a light show and Santa photo-ops. 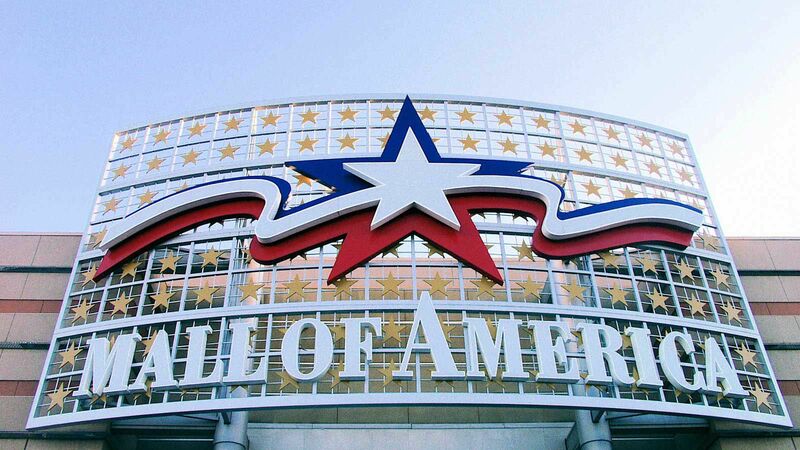 The 20 most-visited shopping malls range from pioneering Mall of America in Minnesota—ranked No. 1 with a staggering 40 million annual visitors—to upscale NorthPark Center, which displays rotating works by artists like Andy Warhol and Roy Lichtenstein and hosts events during the Dallas International Film Festival. Sure, nearly every large mall has a movie complex and food court these days. But what was cutting edge 20 years ago is now old hat, as malls up the ante on their extras. According to Tama Shor, publisher of the Directory of Major Malls, which compiles data on more than 7,200 malls and shopping centers in the U.S. and Canada, ice rinks within malls used to be a big deal, but no longer. Among the more innovative additions are an indoor reptile zoo at Gurnee Mills near Chicago, a permanent catwalk for fashion shows (and Santa’s arrival) at Fashion Show in Las Vegas, an indoor tennis club at the Houston Galleria, and the massive new aquarium (nurturing more than 10,000 sea creatures) at the Mall of America. And developers are thinking even bigger. The 3-million-square-foot American Dream Meadowlands mall is under construction in northern New Jersey with ambitious plans for an indoor ski/snowboard slope, a skydive simulator, and full-scale amusement and water parks. Chances are these 20 most-visited shopping malls will gear up for the competition. Methodology: We obtained the latest Directory of Major Malls list of the top 50 largest enclosed malls in the United States and set out to determine annual visitor numbers. Some mall owners were glad to share their latest data; others either refused or said they don’t keep track of how many people come through their doors. In cases where we couldn’t get the data directly from the malls, we used alternative sources including chambers of commerce, newspapers, advertising agencies, and tourism websites. Given that people don’t purchase tickets to a mall, all of the annual visitation numbers are estimates no matter what the source. We focused on traditional enclosed malls, avoiding outlet malls as well as unconventional designs like the open-air Ala Moana Center in Honolulu, which attracts roughly 42 million visitors per year, and Chesterfield Commons near St. Louis, considered the most popular strip mall, with about 10 million annual visitors. The greater Miami area’s largest mall is an integral part of a super-posh coastal enclave that includes the Turnberry Isle resort and championship golf course, Gulfstream Park thoroughbred horse track, and the upscale Golden Beach/Golden Isles residential area. Cashing in on south Florida’s tourism bounty, the mall organizes shopping experiences for visiting conventions and hosts special events like the Chocolate Festival, Great American Bake Sale, Miami’s Most Photogenic Baby contest, and a regular farmers’ market. The prototypical L.A. mall, Del Amo has appeared in movies like Valley Girl, Bad Santa, and Beverly Hills 90210. It attracts a mixed bag of well-heeled Palos Verdes residents, surfer dudes from nearby Redondo Beach, and inner-city patrons from Compton and Long Beach. Del Amo’s most popular entertainment attractions are an 18-theater Cineplex and a Lucky Strike Lanes bowling alley. Located just outside of Chicago, Woodfield is the number one tourist destination in the State of Illinois. Its name pays posthumous tribute to two of the greatest retailers of all time: General Robert E. Wood of Sears fame and the legendary Marshall Field. Many of the specialty stores are the largest of their kind in the U.S., and Woodfield is often used to test new store design and marketing concepts. Its trademark stainless-steel sculptures were fashioned by artist Robert Engman. Like Del Amo on the left coast, this Florida landmark is one of the anchor properties of the Simon Property Group, the nation’s largest mall owner. Sawgrass takes its name from the nearby Everglades, located just across the expressway from the mall on the western outskirts of Fort Lauderdale. In addition to the core enclosed area, Sawgrass includes an outdoor entertainment area called the Oasis and an outlet component dubbed the Colonnade. The monarch of Pennsylvania malls is located in upscale Montgomery County, not far from Valley Forge on the western fringe of Philadelphia. It’s one of the oldest mega-malls, and the original core has evolved into two distinct indoor malls (the Plaza and the Court) and more than half a dozen large peripheral stores. With around a quarter of the patrons hailing from outside the Philly metro area, several nearby hotels (like the Radisson Valley Forge) offer “sleep and shop” packages that include KOP gift cards, discounts, and complimentary transportation. The largest mall in the Lone Star State is one of Houston’s leading tourist attractions. An oasis of air-conditioning during the sweltering summers, the mall also lures with its upscale tennis and athletic club, an indoor ice rink, the Little Galleria interactive play area for kids, and 50 restaurants. The Galleria’s vaulted glass ceilings were inspired by Italian Renaissance arcades. One of the nation’s newer mega-malls, Palisades sprawls on the west side of the Hudson River about an hour’s drive north of Manhattan. Even those who loathe shopping can find something to draw them here, whether it’s the large cinema complex, the bowling alley, the carousel, the ice rink, or the 40-plus food and beverage options. Its most unusual claim to fame is historic Mount Moor Cemetery, founded in 1849 as a burial place for local African Americans and now surrounded by a parking lot on the mall’s south side. Another of Chicagoland’s mega-malls, Gurnee Mills was also a pioneer of mixing retail and entertainment. Ice-skating, laser tag, miniature golf, and a 20-theater Cineplex count among its many nonshopping attractions. There’s even an indoor zoo called Serpent Safari, where various snakes, lizards, turtles, and crocodiles can be viewed and sometimes handled. Get ready to have a photo snapped with a Burmese python draped around your neck. It’s just outside the Beltway, but Tysons Corner is still the place where Washington insiders cruise for Brooks Brothers, Build-A-Bear, and bargains. In addition to more than 300 shops and restaurants, the northern Virginia mall has a large movie complex and a number of community programs, from business classes for high school students to the Tysons Trekkers walking club that encourages local residents to keep fit. One of the grande dames of American mall history, Roosevelt Field debuted in 1956 when suburban Long Island was expanding rapidly. Prior to that, the site was an airfield used by the pioneering likes of Amelia Earhart and Wiley Post; it’s especially remembered as one of the cradles of female aviation. The mall is also distinguished as one of the first high-profile projects designed by a then-unknown architect by the name of I. M. Pei. Manhattan’s iconic department stores—Macy’s and Bloomingdale’s—are the anchor tenants at Roosevelt. The queen of southern California malls is as chic as they come, with the country’s largest concentration of luxury and designer shops to prove it. That sound you hear—above the patter of high heels—is the cha-ching of South Coast cash registers ringing up a U.S.-leading $1.5 billion in sales annually. Each square foot of retail space earns around $800 per annum, nearly twice the national average. Like other L.A.-area malls, the Orange County landmark is also a pop culture icon where numerous movies (Clueless) and TV shows (The O.C. and Laguna Beach: The Real Orange County) have been filmed. It comes as no surprise that Dallas-based Neiman Marcus is one of the anchor tenants at NorthPark, which racks up more than $1 billion in sales each year. Beyond retail, the mall is known for its slick modern architecture and artistic bent. Original works by Henry Moore, Andy Warhol, Roy Lichtenstein, and dozens of other prominent 20th century artists have been displayed here, and NorthPark is a longtime patron (and venue) of the Dallas International Film Festival. It caters to another cultural audience with its public kids’ library, Bookmarks. On the shore of Lake Onondaga, the Carousel Center is morphing into a 2.4-million-square-foot regional mega-mall called Destiny USA that will launch in Spring 2012 with 100-plus new shops, a three-story atrium, and the goal of luring 29 million annual shoppers—which would make it No. 2 in the nation. Among the current mall anchors are Macy’s, Lord & Taylor, Bon-Ton, and Sports Authority, plus smaller outlets such as Apple and Zales. Entertainment runs the gamut from a 17-theater, stadium-seat Cineplex to the namesake carousel, with 42 handmade horses carved in 1909. New York’s third largest mall draws shoppers from around the state capital region. A major makeover in the 1990s doubled its reach to more than 250 stores. These include upscale tenants you won’t find elsewhere in the Albany area—from Swarovski crystal to Apple electronics to Victoria’s Secret and Coach. The mall’s other trump cards are an 18-unit cinema complex that includes an IMAX theater and a Planet Fitness that’s open around the clock on weekdays. From regional retail giant Belk to Chick-fil-A’s holiday breakfast with Santa to the annual Military Appreciation Month, Hanes Mall pays tribute to its southern heritage. Within the heart of North Carolina’s booming Triad/Triangle region, the mall boasts both a well-heeled and well-educated clientele. Other than a bungee-trampoline attraction, there’s nothing especially fancy about its entertainment options. But it still attracts visitors from all over the Southeast, so many area hotels offer Hanes Mall packages. Another one of the nation’s revenue champs, Westfield Garden State draws its big-spending clientele from Bergen County and nearby New York City. Once upon a time this was the world’s largest mall but it’s since been eclipsed. Although more than half a century old, WGS has been renovated and expanded over the years, most recently in 2007 when an entertainment precinct with cinemas and restaurants was added. Owing to local laws that still forbid retail activity on the Lord’s Day, WGS is the nation’s only mega-mall that is closed on Sundays. If you think Niagara Falls is the only tourist attraction in the Buffalo area, think again. Walden Galleria also draws patrons from both sides of the border to its eclectic mix of upscale and main street retail, restaurants, and entertainment options. In the wake of a major makeover in 2008, WG continues to add new tenants, like a Gordon Biersch brewpub and Fossil and Free People boutiques. The Millennium Buffalo hotel next door offers sleep-and-shop packages including one specifically for Canadian visitors. Located in the Boston burbs, New England’s largest mall had its name changed to Natick Collection in 2007. Rather then embrace the new moniker, Beantown’s blue-collar crowd called it snobby and put up such a fuss that ownership reverted to the original name in July 2011. But upscale Euro brands like Gucci, Bottega Veneta, Louis Vuitton, and Ferragamo remain, as do services like valet parking and wireless Internet. Just 17 miles from Disneyland and 11 from Knott’s Berry Farm, Lakewood is the third of the malls on our list situated in the L.A. metropolitan area and easily accessible for the millions of visitors who flock to this area each year. Many historians consider Lakewood the nation’s second “suburban mall,” after Seattle’s Northgate. And in many respects it’s still the epitome of suburban shopping, with a number of stores (Costco, Home Depot, Albertsons) that cater more to locals than out-of-town visitors. Here’s proof that you can teach an old mall new tricks. Over the past decade, a radical $100 million makeover transformed Memorial City from a fading retail star into one of Houston’s most popular tourist attractions. Crowds come for the five new anchors and more than 100 new specialty shops, plus public-spirited special events like the youth symphony rehearsals and summer camp fairs, as well as an ice rink that cools your heels when the outside temperature hits 90. A new skyway leads to a posh Westin hotel offering MCM shopping packages. Buford’s is one of the nation’s newer regional mega-malls—and the southern star of the Simon shopping mall empire. Dixie-flavored retailers include Belk department store and Charming Charlie accessories, while the 20-unit Cineplex with one of Georgia’s only IMAX theaters has broad appeal. The mall’s Village Green area offers a streetscape with restaurants, bandstand, play area, and interactive fountain. That oval object hovering above the Strip isn’t an alien spacecraft that escaped from Area 52 but “The Cloud” that shades Fashion Show mall from the Nevada desert heat. From Saks Fifth Avenue to America’s largest Forever 21 outlet, the 250-plus stores run the gamut of prices, styles, and age appeal. 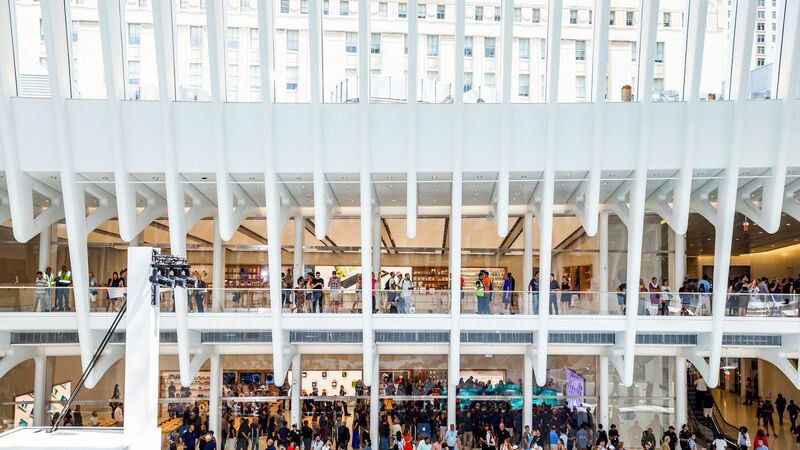 As fits with its home base, the mall pumps up the glitz with regular fashion shows on a permanent catwalk and video projections on The Cloud’s sheet-metal belly—20 stories above the ground. When Fashion Square first opened in the early 1960s, there wasn’t much beyond cactus and sagebrush in this part of the Phoenix metropolitan area. But since then, both the shopping center and Scottsdale have grown into the swankiest part of Arizona. Fashion Square caters to its base with one of the nation’s finest selections of luxury retail: Neiman Marcus, Barneys New York, Dillard’s, and Nordstrom are among the anchor stores, Gucci, Cartier, and Jimmy Choo among the specialty shops. Ranked the nation’s third-most-congested mall during Black Friday 2011, Freehold takes its name from the historic harness racing track next door. The 200-shop mall attracts residents of upscale Monmouth County as well as tourists from the Jersey Shore and across the Garden State. A three-story Nordstrom is the most prominent of half a dozen anchor tenants, but Freehold’s primary strength is an eclectic mix that includes specialty retail, big-box stores, movie theaters, and restaurants. With stores like Bloomingdale’s, Macy’s, Tiffany, and Saks Fifth Avenue, this glitzy south Florida mall could easy be called Manhattan South. But there are also distinct Florida features like the Blue Martini lounge bar. As a bona fide destination mall that attracts a large number of visitors from outside the region (and overseas), Town Center provides its own hotel booking service for shoppers who want to stay longer. The mall’s vast array of luxury shops—Cartier, Bulgari, Louis Vuitton—also caters to a sophisticated international clientele. Although now eclipsed, Yorktown was the largest mall in the United States when it first opened. 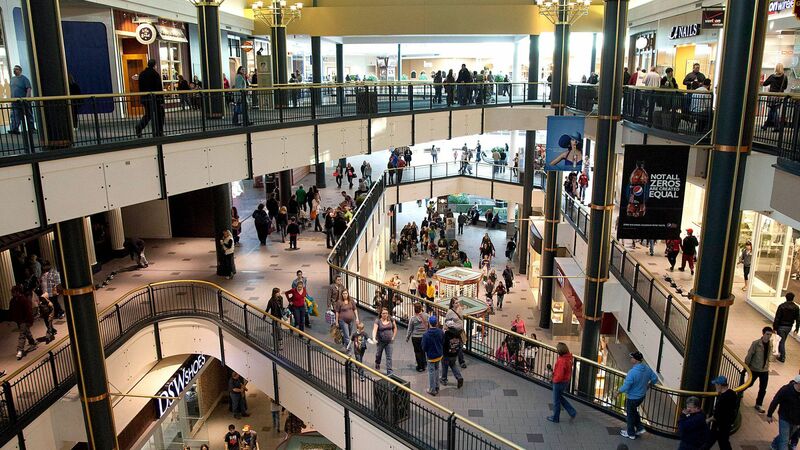 With anchor tenants like Carson Pirie Scott and Von Maur, the mall retains a distinctive midwestern flavor. Located 30 minutes west of downtown Chicago, the mall is close enough to O’Hare Airport to attract travelers with long layovers and a craving to shop. The adjacent 18-story Westin Lombard hotel offers Yorktown Center sleep-and-shop packages. The largest mall in the Pacific Northwest is just 15 minutes from downtown Seattle. Anchor tenants like Macy’s, Sears, and Nordstrom—and more than 200 specialty shops and eateries—make this a great place to while away the region’s many rainy days. Dining options are more daring than your average mall fare: Japanese, Thai, and Caribbean restaurants as well as a Seafood City Marketplace that specializes in Filipino and Asian cuisine. Northland launched in 1954 on the outskirts of Detroit, an early example of the drive-shop synergy that would come to characterize suburban America. Its original amenities included free gas for customers running low on fuel, an infirmary for sick shoppers, and a service that reunited lost children with their parents. Northland was one of the first malls to add movie screenings, and its unusual modular design places anchor store Macy’s in the middle of the complex, surrounded by a galaxy of smaller shops, rather than on the periphery like most shopping centers. As a mixed-genre mall—partly enclosed and partly open-air—Eastwood is sometimes not included on the list of the nation’s largest malls. But without doubt it’s a tourism powerhouse, easily besting other northern Ohio attractions like the Rock and Roll Hall of Fame and Cedar Point Amusement Park. Macy’s and JC Penney are the largest of the mall’s 200-plus retail outlets. Eastwood’s entertainment options include two cinema complexes, a 6,300-seat minor league baseball stadium that doubles as a concert venue, and the Equarium sea-life attraction with its saltwater fish, sharks, and living coral reef.